Comments: Evergreen broadleaf native to New South Wales, Victoria and other parts of Eastern Australia. 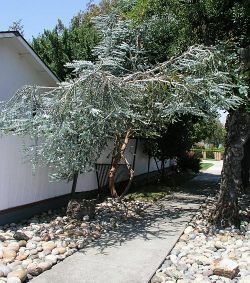 A low growing tree with smooth brown bark and eliptic to round 1" diameter blue-white leaves. Leaf and stem are covered in a white waxy dust. Usually planted as an ornamental or accent tree. There are several species of Eucalyptus referred to as "Silver Dollar" trees, but this one best fits the descriptive title. This tree is tentatively identified as Eucalyptus pruinifera.